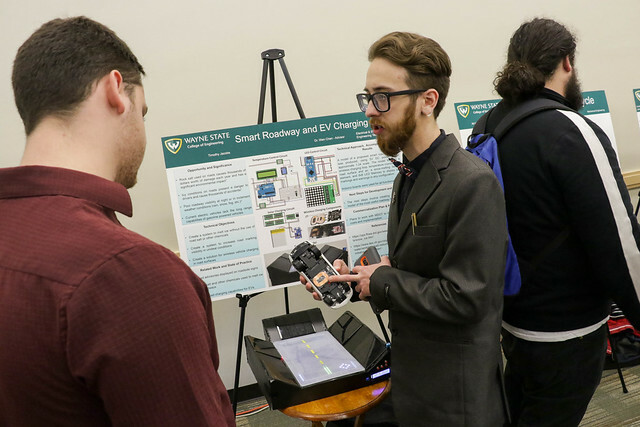 The Wayne State University College of Engineering hosted its fourth annual Student Design and Innovation Day, which showcased 79 unique student projects covering a wide range of applications and engineering disciplines. Taking first place honors was a four-member team of mechanical engineering students — Hana Bagomaan, Russell Charles, Anthony Bertucci, and John Toth — that designed a kit intended to convert a manual wheelchair into a power wheelchair at a significantly lower cost than existing technology but with equivalent functionality. It marks the second year in a row that a mechanical engineering team under the guidance of Professor Golam Newaz has come away with the top prize. “We decided that engineering a retrofit electrification system for a manual wheelchair would be a good challenge that could have a substantial positive impact due to the lack of reasonably priced, high quality, easy to install systems on the market,” said Toth. Other top projects included an economic and environmentally-friendly method of extracting rare earth elements, an optimized coronary artery bypass technique using Adipose-derived stem cells, and a real-time weather data platform for use in remote locations. The Anderson Institute introduced two new prizes this year. The best app award, given to the top functional mobile software application, went to Car Pool, which helps users coordinate ride sharing. An award for the best three-minute video presentation went to a group that developed a predictive model to replicate underwater artifact locations using artificial intelligence and virtual reality. Another new feature at Design Day was a pitch competition, for which 22 projects were selected as finalists. Students were invited to give an oral presentation for a panel of judges that included successful entrepreneurs, venture capitalists, senior managers from various companies, and Wayne State business and engineering faculty. Presenters were graded on technical quality, commercialization potential, and overall presentation quality. A kit that can convert a manual wheelchair into a power wheelchair at a significantly lower cost than existing technology but with equivalent functionality. An economic and environmentally-friendly method of extracting REEs from coal and its by-products for high-tech applications critical to the U.S. economy. A method to optimize coronary artery bypass grafting by differentiating Adipose-derived stem cells into fibroblasts through the addition of platelet-derived growth factor (PDGF) into the culture media. A platform to provide the military and others real-time weather data in remote locations. A mobile app that matches users with similar commutes to coordinate ride sharing, compensate drivers and process payments. A predictive model that replicates ancient Lake Huron landscapes and inhabitants to map experiences of hunters to assist archaeologists in their field work.